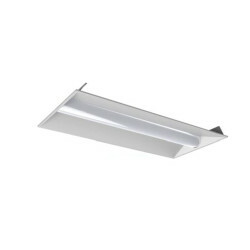 The MaxLite 2’x2’ and 2’x4’LED Volumetric Troffer are replacements for fluorescent fixtures. These LED panels deliver a polished look with their sleek design and advanced light dispersement. This model runs on a 45 watts and generates 4950 lumens. This LED panel comes equipped with a 5 year limited warranty,and is suited for 50,000 hours, and a cool white color temperature of 4000K. These fixtures are ideal solutions for offices, schools, hospitals, retail, and other applications. Also noted that this product is dimmable, damp-listed, and comes with a 5 year warranty.